Life Insurance Industry in India performed well in the financial year 2017-18 registering a growth of 10.99% in the ‘New Business Premium’ underwritten. Industry collected 1,93,865.32 crores of premium against the previous year premium of 1,74675.01 crores. 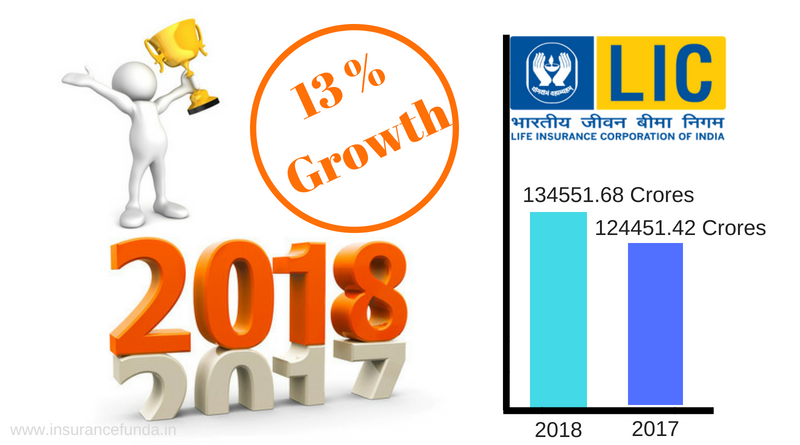 The one and only public sector insurer in India, Life Insurance Corporation of India (LIC) was able to register a growth of 13.46% rise in first year premium income in the financial year 2017-18. The first year premium collection of Rs. 1,34,551.68 crores is an all time high in the history of LIC of India. LIC of India’s premium collection for the previous financial year was Rs. 1,24,451.42. LIC of India continues to retain the lion’s share of the market at 69.40% in terms of first year premium income and 75.67% in terms of number of policies sold. LIC remains number one in the group and pension scheme sector also, with 82807.83 crores new business premium which amounts to 81.38% of market share. The top four private insurance companies in terms of market share of premium income are HDFC Life – 5.85%, SBI Life – 5.66%, ICICI Pru- 4.7% and Max life 2.24%. Indian Insurance Industry is considered as one of the fastest growing insurance industry in the world. The Indian insurance industry is expected to grow to US$ 280 billion by Financial Year 2020. Solid economic growth and increasing personal disposable income are the main factors fuelling this growth. Insurance penetration rate is steadily increasing and has reached 3.49 % in FY 2017 from 2.71 percent in 2001. Government has approved the ordinance to increase Foreign Direct Investment (FDI) limit in Insurance sector from 26 per cent to 49 per cent which would further help attract investments in the sector. The Insurance Regulatory and Development Authority (IRDA) recently allowed life insurance companies that have completed 10 years of operations to raise capital through Initial Public Offerings (IPOs). Government of India launched Pradhan Mantri Vaya Vandana Yojana, a pension scheme which will provide guaranteed 8 per cent annual return to all the senior citizen above 60 years of age for a policy tenure of 10 years. Through the latest amendment, government has doubled the investment limit in PMVVY to Rs. 15 lakh, from the earlier level of Rs. 7.5 lakh.